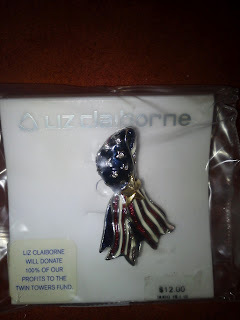 Liz Claiborne patriotic tribute pin to September 11th. Label on pin relates that "Liz Claiborne will donate 100% of our proceeds to the Twin Towers Fund." The pin sold for $12.00. I've raised this issue numerous times with other items from this collection: What were the actual donated proceeds to the 9/11 or in this case, the Twin Towers Fund? Was that an actual fund? The press and investigative reporting on the abuses of nonprofits that started up after 9/11 or implied a connection to 9/11 is warranted, but what about companies who promoted the sale of goods and merchandise tied to donations of proceeds to 9/11 victims, funds, etc? There have never been any public accounting of these donated funds. Were they actually donated? It would be interesting to see what kind of accountably there is amongst the corporate sector for such sales driven by charitable motivations. Let's label this consumer and charity mix. Possible names: consumercharity sales; feel good consumption; or donation spending. Have your own suggestions? Share them here, or e-mail me.